When height is not at a premium, but maximum lift capacity is critical, the Fork Mounted Jib allows the movement of long and awkward loads from inaccessible locations with the potential of 4 different lifting centres. 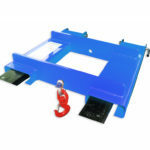 The extending version allows the movement of long and awkward loads from inaccessible locations with up to 9 different lifting positions and with the added benefit of two hooks and shackles so as to ‘cradle’ your load. 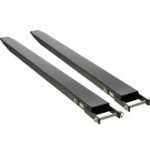 Fork Extensions provide a simple, but effective method of handling the occasional long and awkward load that extends past the tips of the standard forks. (maximum overhang 66%). 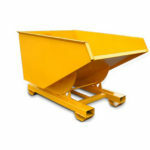 Designed to safely hold, move and dispose of materials such as rubble & soil on building sites & yards. The Site Skip has quality and durability as a priority with mechanics that can withstand even the harshest of site conditions. A range of extras are available on request. 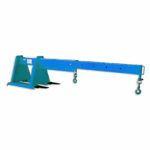 Fork Mounted Hooks provide an economical and safe method of converting a forklift truck into a mini mobile crane. Multiple lifting positions can be achieved along the fork blade. Protier Access Platforms provide a safe means off accessing elevated areas with the use of a forklift truck. Our cages aref ully designed and tested within stricks guidelines, ensuring the safety of its users. 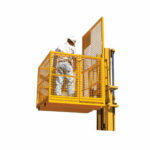 Can be supplied for use with both crane & forklift with or without roof. Designed for the safe transportation of gas bottles on site. Can be used with both fork lift truck and overhead crane. 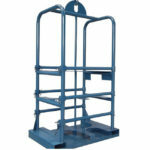 Cages come complete with lifting points and fork pockets.The cages allow easy access for loading and unloading of gas bottles. Bottles are simply secured using ratchet systems.